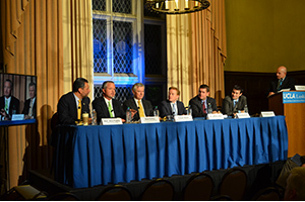 Last month's CACEO panel discussion drew over 250 views (both in-person and online). The conversation included continued discussion on vote centers, technology to improve turnout and how California's voters might engage in the upcoming elections. View the archived broadcast online. The Clerk Legislative Committee is off to a good start for 2016. The Committee has opted to sponsor six proposals for the 2016 session. For more info regarding the proposals contact the committee co-chairs Donna Allred or Victoria Rodriguez. The Clerk of the Board of Supervisors Legislative Committee is currently reviewing AB1709 to examine whether the bill would make simple PRA records requests unnecessarily burdensome. Click to read more. FOCE's annual conference brings together election administrators, community organizations, and reform advocates to discuss the latest developments in the field of elections. The 2016 conference will be your chance to learn new ways to serve our diverse electorate here in California. Register today by clicking here! Take advantage of the explosion of social media - and what is sure to be a focal point in the upcoming elections - and learn about how to leverage social media for your organization. CACEO is hosting training in Sacramento on February 17th and in Orange County on February 19th. Call 714-567-7620 for details or to reserve your space. Mark your calendars for our annual conference, taking place July 11-15, 2016 in Redondo Beach.